So what’s this pose about? Well, in order to learn that – let’s have a think about what it’s not…. And it’s most definitely not about fitting some idealistic version of the ‘shape’ of paschimottanasana…. It’s about moving slowly and breathing in to it…. The word Paschimottanasana actually translates as ‘the stretching of the west pose’. The origin of this name comes from the yogic tradition of facing the rising sun (in the East) to practice sun salutations – therefore the front of the body was known as the ‘East’ side of the body; and the back of the body was known as the ‘West’ side of the body. Many people come to yoga with an idea that every pose we do must look like the pictures in books, and that until your pose looks ‘perfect’, you haven’t ‘done’ that one yet. Well, the revelation is that our bodies aren’t all the same as the ones in books – we’re all unique and therefore everyone’s Paschimottanasana is going to look at least a little different…. And thank goodness for that – wouldn’t it be boring if we were all the same? Keep the kneecaps lifted in order to keep the quadriceps engaged. This engagement at the front of the thighs will encourage the hamstrings to release and allow them to lengthen in a safe and controlled way. Continue to fold; inhaling to lengthen the spine and exhaling to deepen the fold a little more. Let the hands come to rest wherever they land; forget about reaching for the toes, and if you can hold on to the feet easily, then also forget about reaching for the toes – reach beyond the toes! Stay here for at least 10 breaths to really feel what Paschimottanasana feels like. It takes around 2-and-a-half minutes for a proper stretch to occur within the body, so give it some time…. To come out; inhale and gently walk the hands back towards you, engaging the abdominal muscles and lengthening the tailbone down. To counterpose, you could take Pursvottanasana, which means ‘the stretching of the East’, and yes you guessed it – you’ll be opening and lengthening the front of the body. * Never push, force or bounce! This simply encourages the hamstrings to contract more, making us more susceptible to injury and basically ‘scaring’ the muscles a little, so they’re not as likely to want to lengthen to that extent again with ease. * Ensure you are leading with the chest, as rounding the back does nothing to help you here – in fact; it just takes you further away from that deep forward fold and lengthening of the spine. Remember to respect where you get to in this pose; it may be different each day depending on what else you’ve been doing. 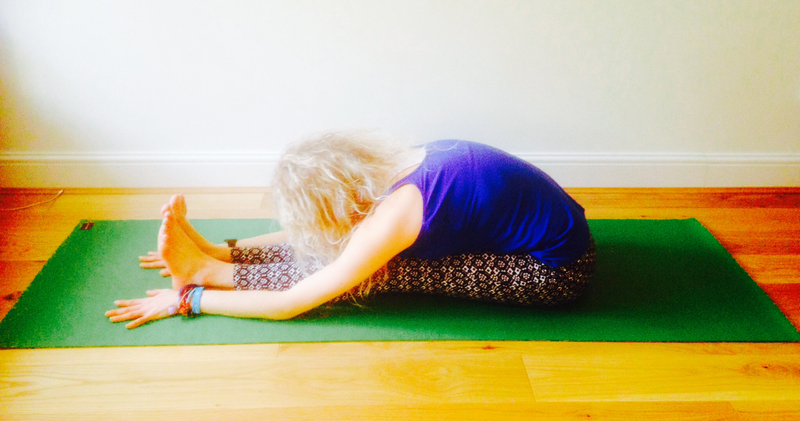 Paschimottanasana it may look simple, but it’s often the simplest poses which teach us the most about ourselves….